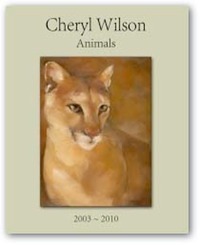 This slim volume holds many of Cheryl’s oil paintings of animals created during the years 2003-2010. Quotations by prominent people throughout history, reflecting love and respect for animals, accompany many of the paintings, providing occasion for thoughtful reflection that appeals to animal lovers of all ages. $29.95 plus tax and shipping. You may place on order for the book by clicking the link below.